Enjoy the top 8 famous quotes, sayings and quotations by Michael Spinks. I had heard everything, Larry gonna knock me out, he gonna beat me, this and that. I got so sick of that. I had a little talk with myself in my bedroom and I said, Don't think about getting in the ring with Larry Holmes, I mean, Don't forget Larry Holmes is getting in the ring with you. You're champ for so many years. And just do what you're best at. What I am best at was not letting anybody have their way with me in the ring. Want to see more pictures of Michael Spinks quotes? 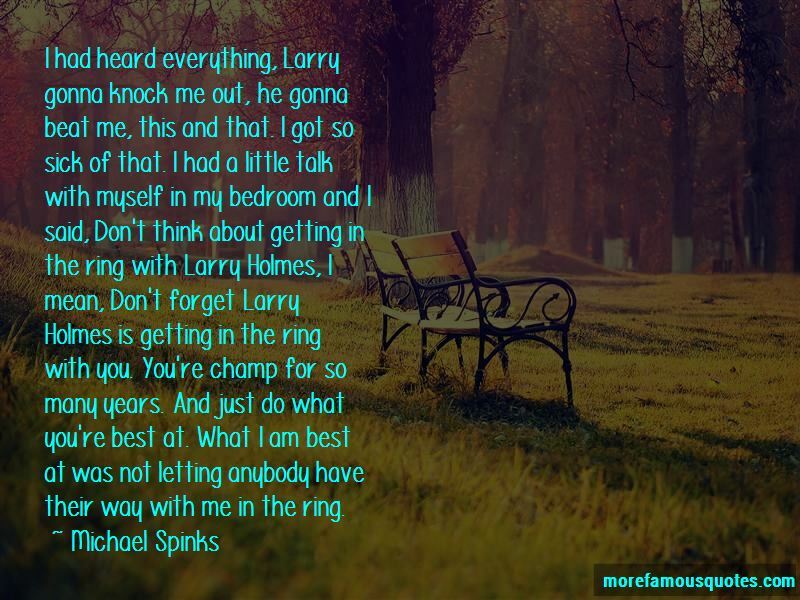 Click on image of Michael Spinks quotes to view full size.